Part of the SAP HANA Academy‘s SAP HANA Vora 1.3 playlist, Tahir Hussain “Bob” Babar details how to setup and use the SAP HANA Vora Developer Edition 1.3 in a series of five videos. In the first video Bob shows how to request access to the Vora Developer Edition AMI in Amazon Web Services. First elect to install SAP Vora, Developer Edition on AWS from sap.com. Follow the steps in the blog to instantiate the SAP HANA Vora Developer Edition on AWS. After signing up and agreeing to the license you will have access to the Vora Developer Edition home page which contains a wealth of excellent resources. One prerequisite is that you have an AWS account. Creating one is simple as you just need a credit card and phone number. Please follow this video for step by step instructions. You can use any browser to install SAP HANA Vora Developer Edition but Bob recommends using Chrome later on to preform some of the tasks. On the Sign Up for SAP Vora AMIs page make sure you select the correct product, set the proper region, and add your AWS Account Id. Your Account Id is located on the My Account page from the AWS Management Console. After agreeing to the end user license agreement you will get a link to the SAP HANA Vora Developer Edition 1.3 AMI. In the second part of the series Bob shows how to create Virtual Private Clouds and Security Groups so that the SAP HANA Vora Developer Edition image can be used. A VPC is an isolated virtual network that is easy to create with a wizard-based tool. 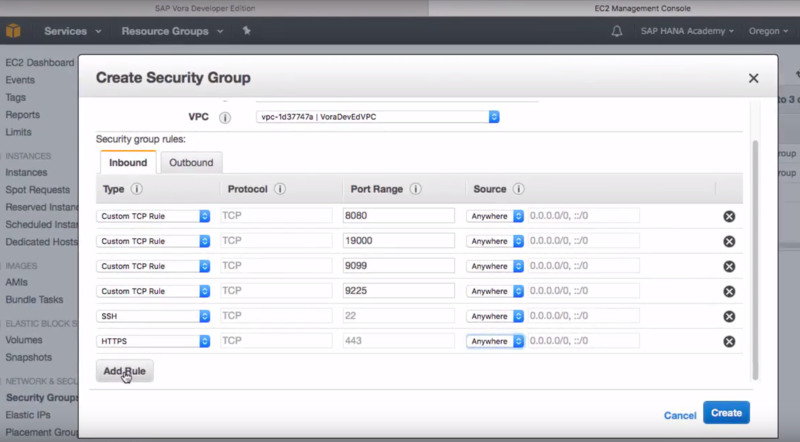 Select VPC from the services menu in AWS and click on the Start VPC wizard button. Name the VPC, leave the defaults and then click create VPC. Now that you have a VPC you need to build a security group. A Security Group acts as a virtual firewall that controls the traffic for one or more instances. When you launch any instance in AWS you associate one or more security group with the instance. You can add rules to the Security Group that control traffic by regulating what machines can access what ports. So, go back to the EC2 dashboard, select Security Groups under NETWORK & SECURITY and click on Create Security Group. Give the Security Group a name and description and then select the proper VPC. Click the Add Rule button to specify Inbound rules. First Bob opens up port 8080 for Ambari and allows anyone as a source to access the port. Bob also opens up the port 19000, for the Vora manager, port 9099, for Zeppelin, port 9225, for the Vora tools, and also the ports for SSH and HTTPS. Bob sets all of those sources and anywhere and then presses create. Next, Bob modifies the Security Group so that the Master Node, Worker Nodes and Data Nodes that will be created in the Vora Manager can all speak to each other. Bob edits the Security Group by adding a new rule called All TCP with a custom source that is the Security Group. Bob follows the same process to create a new rule for All UDP, All ICMP – iPv4 and All ICMP – iPv6 before clicking save. Bob has allowed access from anywhere but you may wish to be more secure and restrict the access to only your IP address. In the third tutorial video of the series Bob shows how to launch the SAP HANA Vora Developer Edition Manager. Back in the EC2 Dashboard, launch the AMI and choose m4.2xlarge as the type of instance. Then make sure that the selected network is your VPC on Step 3: Configure Instance Details and leave the rest as the default options before proceeding on. Leave the defaults for the storage. On Step 5 add a tag and then configure the Security Group before selecting to launch the AMI. Then create a Key Pair and download and save it, before launching the instance. Choose to show the Column for iPv4 Public IP to see the public IP address for your instance. Bob then changes his instance name to a more friendly one that reads Vora Developer Edition – Manager. In the fourth video Bob details how to use the SAP HANA Vora Developer Edition Manager to create a SAP HANA Vora cluster. Navigate to your instance’s public IP address in a browser and authenticate your identity by entering your AWS account’s Access Key ID and Secret Access Key. Then read and accept the End User License Agreement before setting the Cluster Manager console and Ambari “admin” user password. 15 to 20 minutes after you click on Setup SAP HANA Vora, your SAP HANA Vora Developer Edition Cluster Manager should be ready to use. Back in AWS you can see that you’ve now added a masterVora and a pair of workerVora machines to your list of instances. Once all four machines in your Manager are running you can test the resources. The resources are Ambari, Vora and Zeppelin. First log into Ambari and then confirm that all of the correct services and hosts are running. Also, test to make sure everything in the Vora tools is working. Bob recommends testing the Vora tools using a Chrome browser. Finally, test Zeppelin to ensure that it is working properly as well. In the fifth and final video of the series Bob details how to add data nodes to a SAP HANA Vora cluster using the SAP HANA Vora Developer Edition. Access your SAP HANA Vora Cluster Manager on a Chrome web browser and confirm that you have the four servers up and running. The four servers are Master, Worker, Worker 2, and Manager. To configure nodes select the Vora UI under the resources header and login. If you want to learn more details about how to use the SAP HANA Vora Manger in SAP HANA Vora 1.3 then please watch this video. To add a new data node go back to the SAP HANA Vora Cluster Manager and click on the green ADD NODE button. Leave the default option and a new instance will be created in AWS for a new data node in around 10 to 15 minutes. To test the new node go back into the SAP HANA Vora Manager and navigate to the nodes section. There you should see the new data node that will is now indicated as another worker node. To further confirm, the number of DataNodes Live listed in Ambari should have been increased by one. In this short five video series Bob showed how to use the SAP HANA Vora Developer Edition 1.3 to add a data node to a SAP HANA Vora cluster. Subscribe to the SAP HANA Academy YouTube channel to stay up to date with our latest free tutorial videos. Learn how to use the ins, outs and all the in betweens of SAP HANA from the SAP HANA Academy’s library of over 2,000 free videos. Please follow us on Twitter @saphanaacadmey and connect with us on LinkedIn.